Yikes! 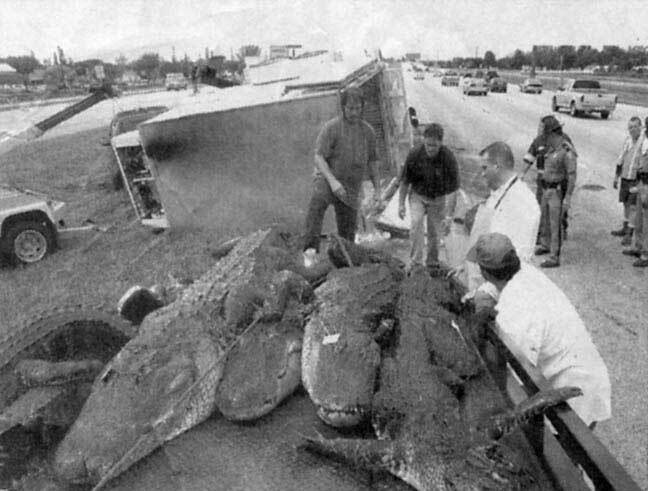 A trailer carrying 26 alligator carcasses to a processing plant overturned on a Fort Lauderdale highway (year unknown). The carcasses, which weighed about 10,000 pounds were put on a flatbed truck and taken to the processing plant. Who knew alligators were being hauled around the country? Alligator farming is big business in Florida, Texas and Louisiana, producing about 45,000 hides a year. 6-7 foot hides sell for as much as $300. The market for alligator meat also produces about 300,000 pounds a year. Alligators should not be confused with crocodiles, which are a completely different animal. One way to tell the difference is that alligators teeth do not show when their mouth is closed, crocodiles do.